MILLIONS of wildebeest and zebra during the Great Migration season and year-round game concentration make this the most epic safari journey. 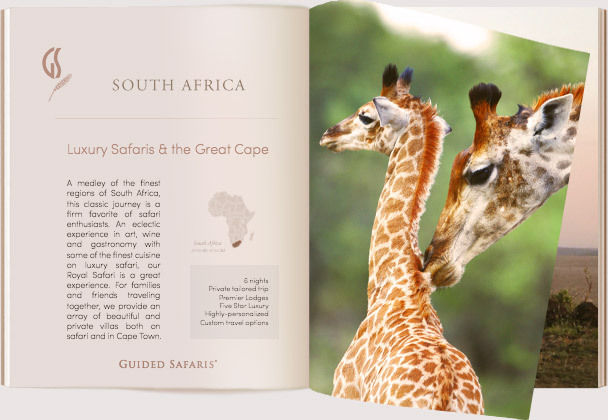 Talk to our Chief safari designers at Guided Safaris® to source seasonal advise for travel based on current migration patterns. Spectacular wildlife viewing in our private game reserves, exclusive to our lodge guests, offers Big Cats and all the plains game you'd expect on safari at these off-the-beaten path locations. Excellent photographic opportunities await in these famously documented, yet highly private and wildlife-rich locations. 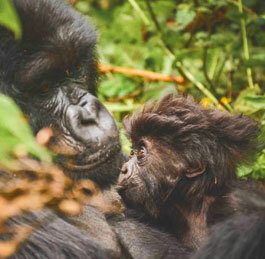 Our professional guides, the most experienced in East Africa, help offer insights into animal behavior and bring guests up close to wildlife offering photography tips and positioning ideas to capture these animals in their uninterrupted, relaxed state of nature. Crossing from the Great Serengeti eco-system to the border of the famous Mara River offers varied species sightings and phenomenal birding famous along the Rift Valley. Many rarer wildlife species, such as the Black Rhino and bat-eared fox, are also frequently viewed. The most exclusive East African adventure. Glamorous safari concepts. Enjoy the chic canvas suites on the plains of Mara offering immense closeness to nature followed by a decadent finish at the high-end luxury of our Private Lodges that offer a view like no other of the vast Great Serengeti plains! Enjoy gourmet safari cuisine with a premium wine list from our award-winning lodge wine cellars - all included in your stay. The MOST private migration safari experience on earth. Private 350,000-acres in the Great Serengeti and the most remote and exclusive locations. No crowds, and incredible game viewing. Our Signature 350,000-acre private wilderness is exclusive to our camp guests alone - the most exclusive concession of its kind in the entire Serengeti region. Our Mara River crossing is another unique eco-luxury region with highly-limited access granted to our camp guests. We offer a private experience at the border of the Mara eco-system where the Serengeti plains flow in to views of Masai Mara. 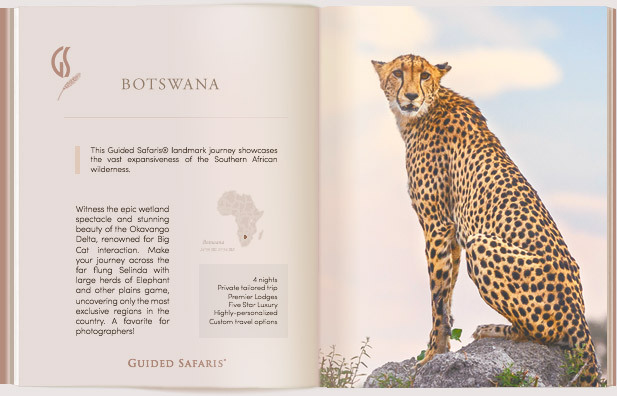 Guided Safaris® guests can travel through a combination of these legendary safari frontiers in complete exclusivity with our professional resident guides who are completely familiarized with the terrain and current wildlife patterns. 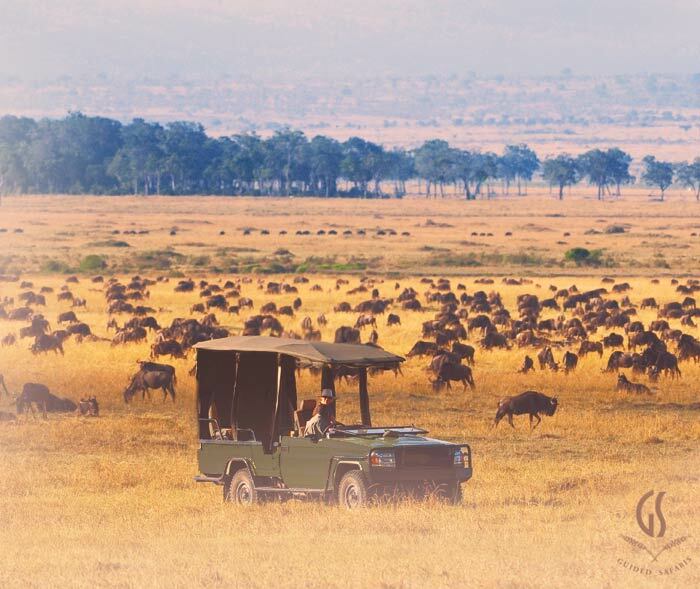 Learn what makes our Great Migration Safari a world-apart from any other offering. No Public Parks; No Touristy Areas. Experience our Private Game Reserves set within the richest concentrations of varied wildlife species for an exceptional game viewing experience to rival anywhere in East Africa. Major filmmakers and photographers journey under our expertise to capture these idyllic realities. No ‘Group Travel’. We don’t do “pre-packaged, set-date safaris” with 20 persons and a khaki-clad chaperone. It’s simply not chic; we’re in complete agreement with 21st century travelers that adventure travel has evolved alongside personal preferences. 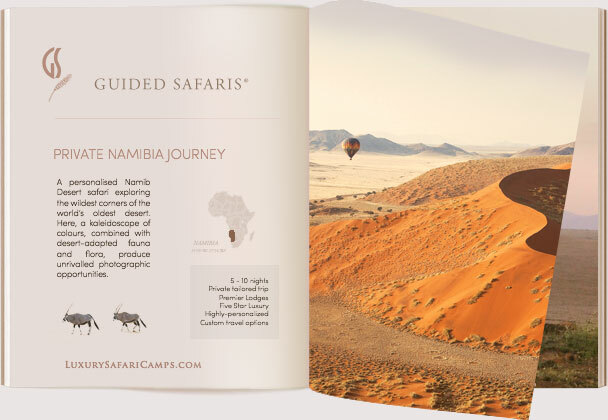 We offer fully-customized, independent, bespoke safaris designed just for you. Your privacy is key to our luxury safari experiences. We offer unmatched savoir faire in tailoring private journeys and adventures to Africa for over 20 years. Game drives in professional safari cruisers. No silly Pop-up-roof Minivans or stuffy ‘watch from the roof’ trucks built in the 80's. Enjoy photography in custom-built 4x4 vehicles with comfy bucket seats and unobtrusive windowless frames for uninterrupted, clutter-free game viewing. 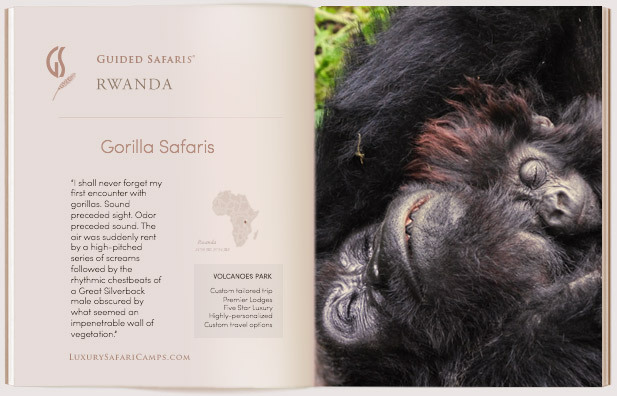 It’s the classier, modern approach and a far better way to view and photograph animals. Real Professional Safari Guides. We work with some of the finest rangers in East Africa, trained at our Private Ranger Academy with resident ecology and field experience, along with the finest trackers to lead your game drives. No need for ‘Specialist Guides’ who fly in from the cities and have no localized understanding of current game patterns in each location. 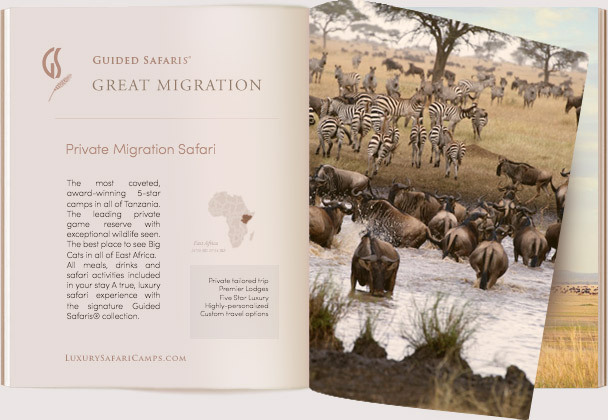 Don't rely on outdated guide books: With Guided Safaris® you have access to true, on-ground knowledge from our resident head guides to position you in the optimal seasons for the Great Migration, changing based on annual updates as they happen on actual location. You will love staying with us in the most luxurious camps in East Africa, set in the most private locations. 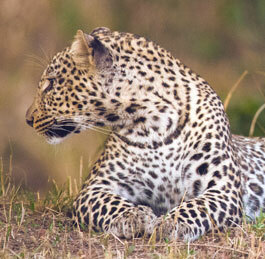 Enjoy exceptional views and settings throughout your safari to maximize on the very ‘Best of East Africa’ experience. All meals and drinks are included at our lodges, per original safari custom: Gourmet menus (elegantly plated, not run-of-the-mill cold buffets), and award-winning wine cellars (not just beer and coke). Meals are relaxed and elegant affairs with sumptuous farm-to-table cooking to rival the finest restaurants on the continent with a unique Swahili flair from our chefs at lodge. See Africa from the most unique perspectives, not just from the inside of a vehicle. We offer vast and varied activities to our safari guests. Go on walking safaris, visit authentic Maasai communities who are at the forefront of our conservation effort, sleep under the stars, go horseback riding or board a completely private balloon safari with your family. 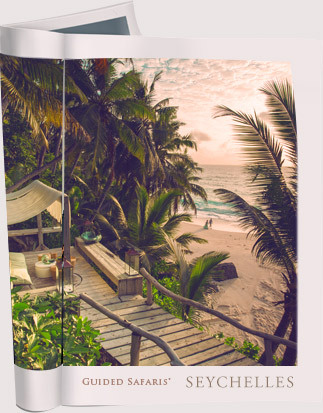 We promise you the journey of a lifetime! Don’t rough it. You’ve spent considerable time and effort planning your escape to Africa. The last thing you want to worry about are logistics and whether your time and investment are being efficiently put to play. Avoid the bumpy roads typical of standard corner cutting tour packages from operators: Our Guided Safaris® on-ground team welcome you at the international airports in Africa and fly you on the most reputable safari carriers to our lodge airstrips rather than have you drag along dusty, unattractive routes and border crossings for hours on end wasting a precious day getting from one location to another and adding unnecessary hardship to your journey. And — we’re still more competitively priced with our custom offerings. Our eco-luxury concept is also the greener way to travel. 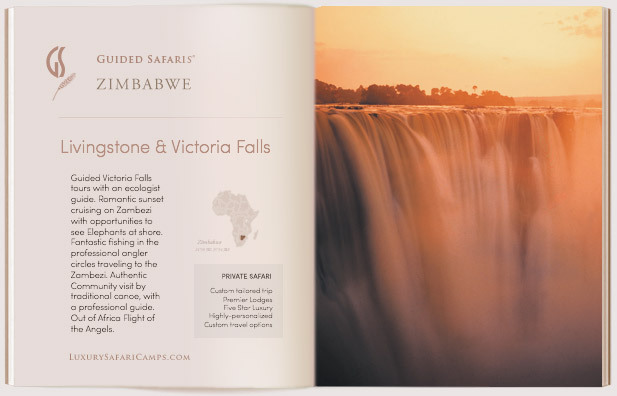 Founded upon luxury safaris and high-end wilderness adventures that support conservation and sustainability, Guided Safaris® has garnered global recognition in the stewardship of Africa’s most extraordinary ecological hotspots and exclusive travel finds. We are eager for every guest to return home from their journey with both the immense satisfaction of having witnessed the grand scale of the Great Migration experience and found themselves a part of it, at least once in their lifetime, as well as the fulfillment of having contributed to its safe guarding and preservation for future generations through their visit. With each journey, we help outline the considerable direct effort at work within each region. Our journeys help support and work hand-in-hand with leading organizations such as Save The Rhino International, Big Life Africa, David Sheldrick Wildlife Trust and many more for the continued safeguarding of our endangered Lion, Elephant and Black Rhino populations. Your Guided Safaris® package includes pretty much everything from start to finish once you arrive in East Africa - including all local flights, transfers, meals, drinks and guided activities. We also have private options for families seeking exclusive accommodations and camp charters. Please contact us to customize your safari.